Karthik (Sumanth) is an atheist who researches on ancient temples. 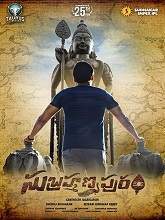 One day, he visits an ancient Lord Subrahmanya Swamy temple located in a village named ‘Subramanyapuram’. As soon as he enters the temple, the villagers get traumatized with a series of suicides. Police, village head and villagers believe it is God cursing them for their wrong deeds and take no action. But, Karthik suspects that there is something else behind this and starts investigating about the suicides.